I took this photo on December 16, 2007, at around noon. It’s facing south from Los Angeles, California. It was a particularly good day for contrails. You can see about seven in this photo. There’s also a nice contrail shadow, and a halo around the sun. 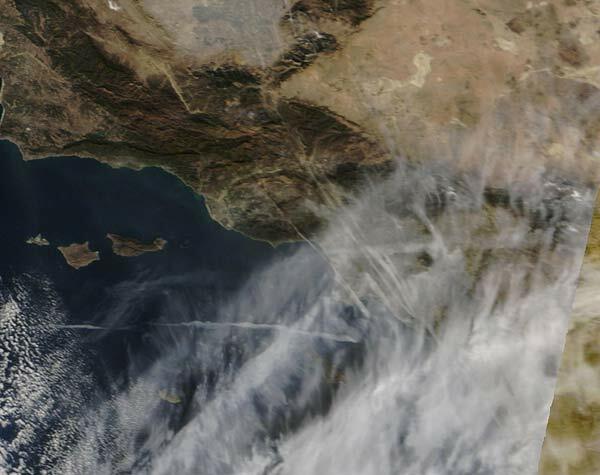 I was looking at the MODIS archive of satellite photos, and realized they had one for that date, and rather luckily it seems to have been taken within an hour of the photo I took, so it shows the exact same contrails from space. LA is just a bit to the right of the center of this photo. As the photos are about an hour apart, the trails have shifted and distorted a little. But you can still match them up. Here I’ve color coded them. It’s interesting also to look at the full size satellite photo of the area, so you can see where trails form, and where they do not form. Los Angeles is in the middle of the photo. 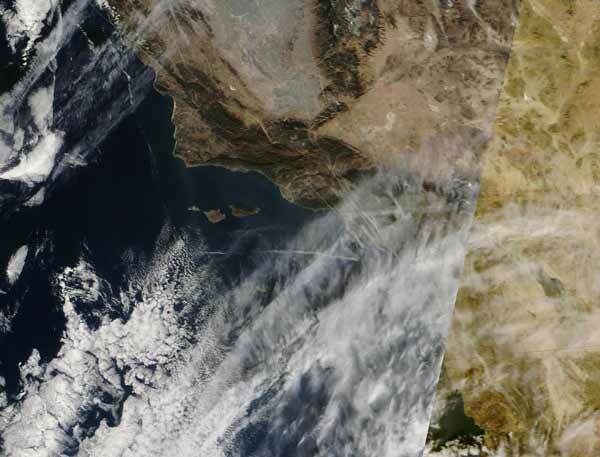 You can see the trails forming over Los Angeles, and it’s quite clear from looking the the cloud bands that they are forming in an area of high humidity. These are probably the same planes that created the trails over Los Angles, just about an hour later, as they continue to fly north. The abrupt start of the trail as it enters the moist air is very obvious here. 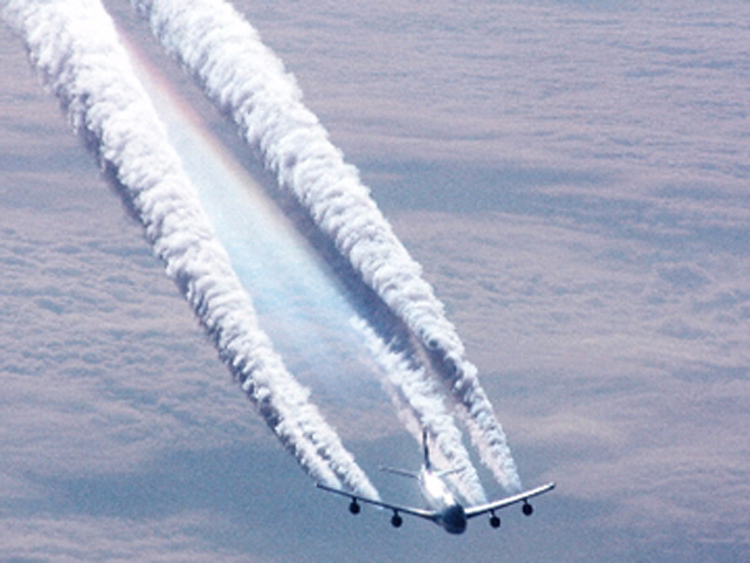 This is all interesting in the context of the “chemtrail” theory. 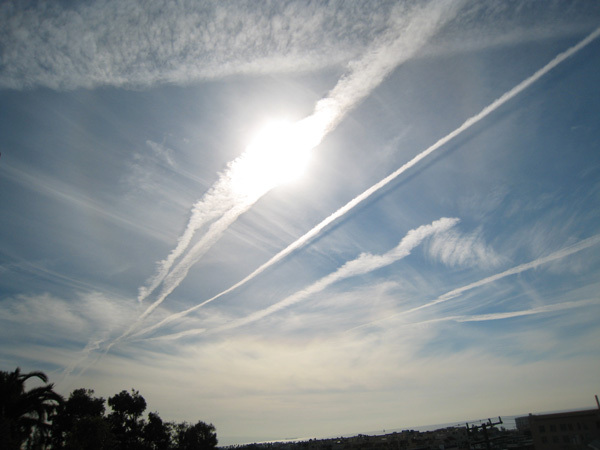 You often hear the chemtrailers posting things like “heavy spraying over Los Angeles today!! !” Then there are days with “no spraying”. MODIS is a wonderful resource for explaining why this perception happens. Sometimes there is a moist region of air at the right level over a particular place, and that place gets a lot of persistent contrails. Looking at contrails from the ground only gives you a little bit of the picture. The satellite photos tell the whole story. And here is the satellite image of the greater area from that day. Austin is on the right, towards the end of the huge sweep of clouds. It’s clear that the contrails are just forming around the edges of a region of high humidity. Thank God! Finally some evidence in the world that chemtrails DO NOT EXIST!These contrails linger due to the cirrus layer floating above LA! Looks like 4 aircraft from Mexico to/from the Bay Area and 2 going west to Honolulu that overflew the LAX VOR. Probably from DFW and ATL. Posted below is a link to a picture taken in The Netherlands of 2 aircraft who seem to fly next to each other. Attached is a screenshot of the SBS radar stream showing the same aircraft and their altitudes, FL370 and FL390. This pic was not taken by me. Please take a look at this video taken from a plane in Japan and explain what is going on here? BTW, satellite photos are perhaps the finest evidence AGAINST chemtrail theory. You’ll notice that you hardly ever get satellite photos of chemtrails(except for a handful of iconic photos showing a day when there were hundred of trail). This is despite the fact that it’s VERY EASY to get a satellite photo of a region on a particular day. 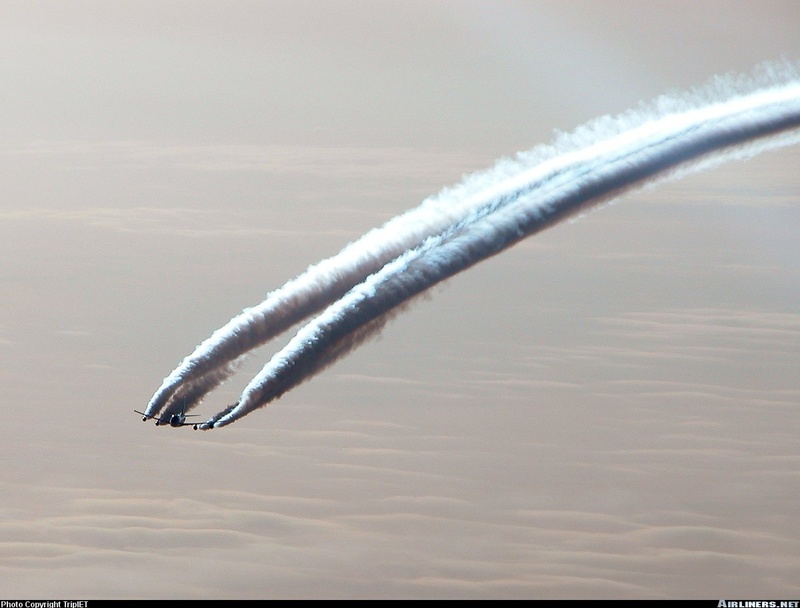 The reason you don’t see these photos is that once you spend some time looking at them, it’s very obvious that the contrails are simply forming in regions of humid air – as you would expect. And that the contrails lay along regular long-distance flight paths – as you would expect. 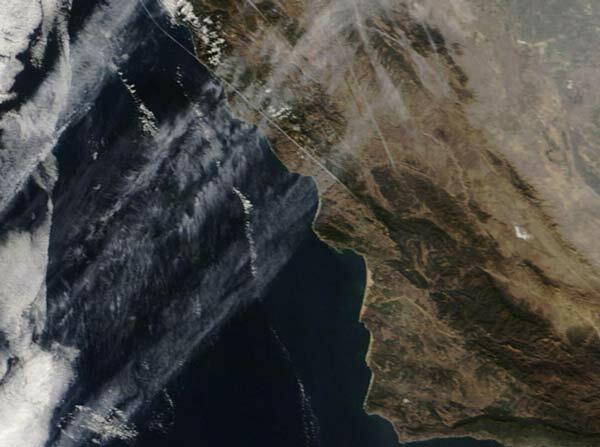 Generally looking at a satellite photo of “chemtrails” will not help the theory, so theorists don’t show them. Selective evidence. Great job generally… I like you objectivity and thoughtful sincerity. I live in Sydney, Australia and have been watching the skies fervently for around seven years. In recent times, I have watched the chem-lines bleeding into the skies with greater complexity – chemtrail formations occurring with multiple lines, without sighting the unmarked planes. but my conclusion is that at times, the chemtrail spraying is being implemented by back engineered tech – also based on complex formations, occurring too quickly. It that were true, then surely it would be trivial to take some video of it to demonstrate it? There is a faint but distinct contrail pattern in a thin cloud layer over the central England, captured by Aqua on March 5th, 2010, at 13:35 UTC. In addition to a putative racetrack contrail over Midlands, it includes a coiled-shaped AWACS-type contrail over East Anglia, cris-crossed with several linear contrails. the angular diameter of the coiled contrail is about 56°; the azimuth and elevation of its highest point (A) are 172° and 26°, respectively, whereas for its right-most point (B), the azimuth is 201° and elevation is 15°. To convert these into linear measurements, I assumed that the coil diameter is approximately equal to the known diameter of AWACS orbit, about 40 km. It gives the estimated distance to point A, the closest to the observer, being about 20(1/sin(56/2°) – 1) = 22 km; the distance to point B being about 20/tan(28°) = 38 km. The estimated altitudes of point A, 22sin(26°) = 9.7 km, and point B, 38sin(15°) = 9.9 km, are very close to each other and to the known operational altitude of AWACS (9.2 km). There are three linear contrails, highlighted with different colors green (G), cyan (C) and magenta (M). The G and C contrails cross the coil, whereas M almost touches it and turns away. By that time, the sun also has moved about 8° to the west and 2° down. It is not seen in the 1:38 PM photograph, but its approximate position can be deduced from the glare in the upper right corner and the black contrail shadow. After the photograph has been scaled down and overlaid onto the central part of the 1:03 PM panorama, so to match the curvatures of the coils, the deduced sun position matches well the calculated position (sun symbol). This means that at 1:03 PM the (earliest) turn of coil was at approximately the same position as the newest turn of the coil on the satellite image at 1:35 PM. Indeed, the angular width of the coil, seen from the actual viewpoint (red pin), and the distances to points A and B are in a good agreement with the estimates from the ground pictures. However, there is a 10° difference between the measured and estimated azimuths of these points. This is because in satellite images the contrails are projected on the ground at some distance from their actual geographical positions, depending on the elevation angle of the satellite. In this case, the estimated elevation angle is less than 45°, so a 10 km altitude contrail is actually some 10 km away from the position of its image in a western direction (the satellite azimuth). The difference between the measured and estimated azimuths of contrails can be compensated fully by placing a virtual viewpoint at the same distance in the opposite direction (about 10 km to the east of the actual one). 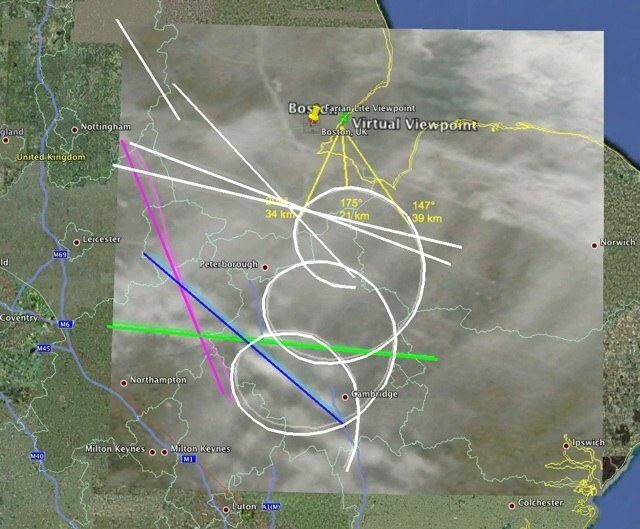 In 30 minutes, the plane made two full turns and its contrail had drifted south by 50 km (wind speed of 100 km/h). The orbit of the plane was in one of the official zones of AWACS operation (http://www.aeroresource.co.uk/aviationmaps/). Its parameters (left-hand turn, 40 km diameter, 15 minute full turn) are also in full agreement with the other reported observations of coiled contrails in and around the UK, attributed to the AWACS planes. Uncinus you should look into getting a telescope setup, it would be awesome where you live. Its also lots of fun. I have heaps of fun with my one and we don’t get alot of planes over northland New Zealand. I’m not so advanced Google Earth user. I have learnt how to trace contrails and to raise the traces above the ground, but I’m yet to figure out how to set a viewpoint, time and date. 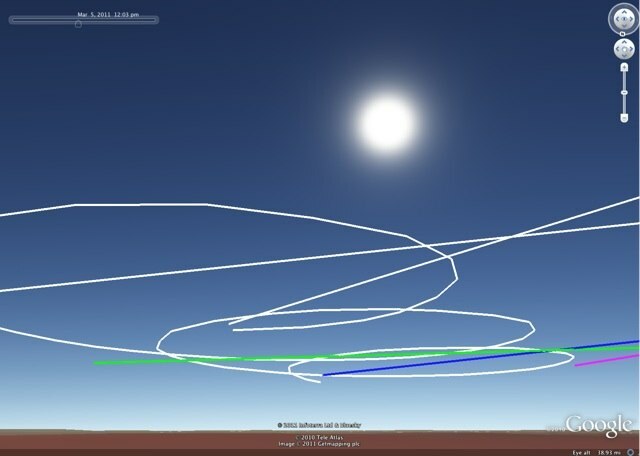 In principle, I intended to look at the contrails in Google Earth from the actual and virtual viewpoints with the sun positions on 13:03 UTC and 13:48 UTC. The UK switches from GMT (=UTC) to BST on the last Sunday of March. BTW, your setting the time an hour early is another way to compensate for the differences in the angular positions of contrails relative the sun. You can do more complex viewpoints with a photo overlay, changing the FOV. But it’s a bit tricky. I have placed the colored contrails together with the earliest turn of the coil (thick white line) to the deduced position at 13:03 UTC, taking into account both the drift of contrails due to the wind and their displacement due to the satellite elevation angle, and raised them to the altitudes of about 9 km. From the Farian’s viewpoint, which I have emulated only approximately, the contrails match their images on the photograph fairly well. To improve the fit, I tilted the photo a bit and put the clock back by 13 min to get the sun position right. Not bad for the first attempt. Very good. The sun position might also be off due to FOV issues. It looks like you could possibly use a slightly wider FOV there. It seems like the viewpoint would be correct, as you narrowed it down to that mini-mall. I think that the main source of error is a low accuracy of my estimates of contrail altitudes and the displacements of their actual positions relative their projections on the satellite images; their probable errors are about ± 1 km. Iin this particular case, the expected error in angular positions due to this factor is about 2-3°. BTW this group of islands is in fact in the Norwegian Sea but is not far from the North Sea. Here is a conclusion to my little research on contrails above and below. What fascinates me in this subject is the possibility to make fairly accurate measurements. 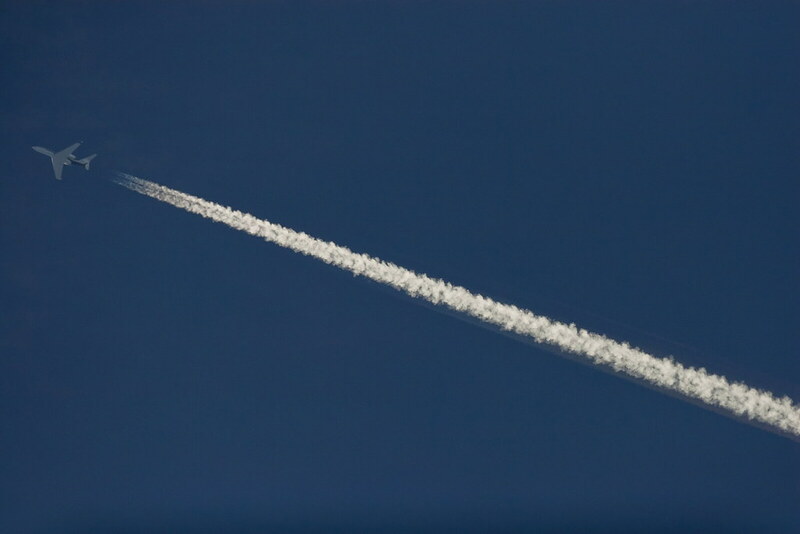 Their results show that contrails are indeed about 10,000 meters above the ground and move with car speed of 100 km/h. Also, most contrails in ground photos are usually tens kilometers away from the camera. This means that atmospheric conditions in the area where contrails are forming may well differ from the conditions above the observer. Indeed, in both examples, satellite images show that they are forming in an area of high humidity, but the skies between them and observers’ viewpoints are fairly clear. It is also possible to estimate the age of coiled contrails in the photos. For the oldest visible parts in the first case it approaches one hour, in the second case it is nearly one hour and half. These contrails probably persisted even for longer. (I did not get it exactly right from the first go and adjusted the initial fit by other means). 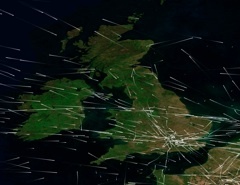 In the time between the ground and satellite photos, the contrails moved relative the ground by 32 km (20 miles) (can’t find the time of satellite photo, as MODIS data for the end of 2007 are currently unavailable). As expected, the altitudes of the highlighted contrails are all in the range 9-10 km, the cruising altitudes of commercial jets. Can someone teach me to calculate contrails’ altitude from ground observation?? Unless you know exactly how far away they are from you laterally there’s no way to determine how high they are. I don’t remember the math but you need at least two things- an angle and the length of one leg of the triangle. You could get the angle easily but without at least one leg you can’t get the rest. SOmeone correct me if I’m wrong. There’s several fairly reliable methods for infering the altitude that have been mentioned here before. Flightaware etc. See chapter IX, page 137 in the book. (The full PDF of the book is linked there, and there’s also better version of the plates I scanned in). That only gives you altitude if directly overhead though. Thank you very much lads and lasses!, I wonder if I´ll figure out. I´ll tell you anyway. Thank you indeed. A general method is to take the elevation and azimuth angles of an identifiable point on the contrail at the same time from two different known locations. The azimuth angles will give you the location of the contrail point and distances from it to each location. Combined with the elevation angles, these distances will give you the altitude. In order to achieve a good accuracy, the two locations should be separated by a sufficiently long distance, about a mile at least. http://contrailscience.com/racetrack-contrails/#comment-58735. One location was known a priori, the second one was identified by guessing the likely altitude of the contrail. After that the altitude, in principle, can be recalculated directly from the pictures, using the identifiable self-crossing points A, B an C.
I thought about setting in different parts of the city a number of synchronised webcams with fixed orientations and parameters to take accurate measurements of the contrails’ azimuths and elevations, but so far I had no time and resources to implement this idea. Your webcam suggestion is similar to the 1905 method, which uses the position of the sun, and two cameras at known positions. Given the sun is essentially an infinite distance away, you can treat it as a fixed point, then given the shift in the position of a feature of the cloud relative to the sun, and knowing the position of the cameras, you can work out how far away the cloud is, and how high it is above the ground. Using the sun removed the need to measure the angle of the cameras – which is very difficult to get accurately. It might be fun to implement such a scheme with synchronized web cams – reviving work from over 100 years ago. but two similar relays were brought into action, and each of these sent the current from a local battery of Leclanche cells through the electro-magnet on the camera and made the exposure. and any special point of the cloud were different For instance, if the cloud were east of the sun, with its edge just apparently touching the solar image as photographed from the eastern station, then the negative taken from the western end of the base would show an interval of clear sky between the two, which would be greater as the cloud was lower. was often as much as an inch. With higher clouds the differences were smaller, but unless the sun was very low in the sky, either east or west, the dis- placements of the cloud image were great enough to give reliable measures. Specimen prints from a pair of negatives are shown in Plate 63. The processes by which the measurements are worked out are laborious,* and consist of two parts, the first being the determination of the exact posi- tion of the sun from the date, hour, and latitude and longitude of the place, and the second, the deter* mination of the position of the cloud. Two points which represent the same part of the cloud are selected, and their respective distances from the two lines drawn through the sun are measured as accurately as possible. Now, a certain distance on the negative corresponds with a definite angular displacement, and a scale can be constructed show- ing how much should be added to or subtracted from the sun’s position to get the exact position of the cloud. This being done, it is then a simple piece of trigonometry to reduce the actual height of the cloud above the place of observation. The work of computation, however, was greatly lightened by the fact that many of the pairs of negatives showed more than one layer of cloud; very often two, and not unfrequently as many as three, layers, and, consequently, one determination of the sun’s position sufficed for several distinct results. I wrote about this in January 2008. It does have some triangulation functions as well. Given that iPhone also have GPS, it should be possible to write an app to actually do all the analysis for you – you could even have it synchronise two iphone over the internet. I don’t know what the accuracy would be though. I Like Clayden’s approach though – the center of the sun is very precise. Note he used a baseline of just 600 feet, or about 5% of the typical altitude. GPS is not that accurate, about 20-50 feet off on my phone. So measuring positions on a map (Google Earth gives you point altitude as well) would still be better if someone did an iPhone triangulation app. In fact, the simplest calculator might be one where you enter in points A and B as lat/long/alt, then use either point C in the photos with the same inputs (a landmark) or the sun, with the date and time. These also assume the camera is not rolled at all. To correct for that you’d need two reference points in the photos. You might also need to account for curvature of the earth – remember people often claim that contrails are low, or fall to the ground, when in reality (judging by the photos), the contrails are just near the horizon, and/or are blown over the horizon away from the viewer. The photo had been taken on February 2nd, 2011, at 11:34 AM local time. From other EXIF data, the vertical field of view is about 44° that gives the estimated Sun altitude S being about 22° and the elevations of contrails in the point where they “converge” below Sun C being about 11-12°. Later Jacobo revealed that he lives in Calgary. The city’s latitude, approximately 50°N, is as expected from the Sun altitude for the time and date. It is hard to detect contrails against the snow-covered ground in the satellite images of this area on the day, but, in the high resolution Terra image (http://rapidfire.sci.gsfc.nasa.gov/subsets/?subset=AERONET_Suffield.2011033.terra.250m), there can be seen shadows of contrails on the ground south of Calgary. The actual contrail positions had to lay further south. 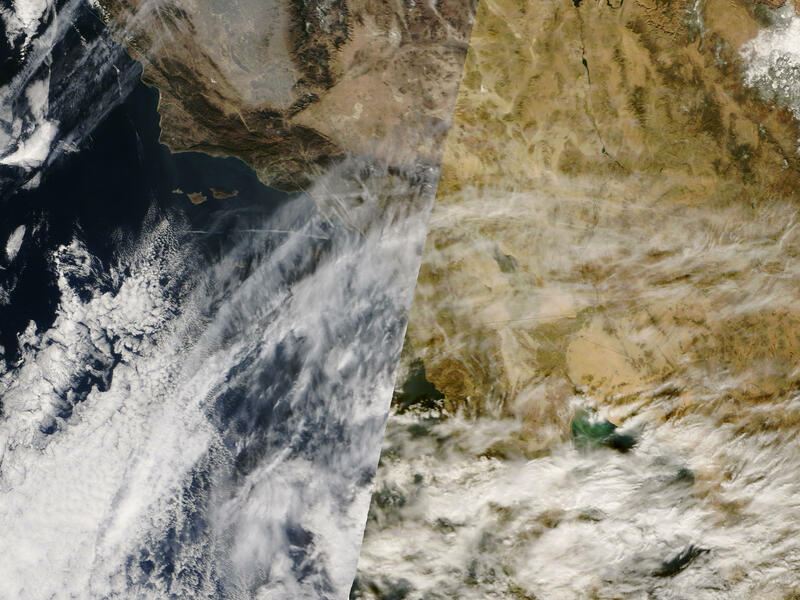 This part of the composite satellite image had been taken at practically the same time as the Jacobo’s picture, near the end of a five-minute swath beginning at 18:30 UTC (11:30 MST). The shadows apparently belong to the same contrails as in the picture. I’ve just sent a post with five pictures that has not been published. Is it in the moderation queue? It got deleted by my agressive filter. Possible because of the number of images. They are rather large too. I see. The pictures are there, but my text has been lost. Sadly, I did not save it. Nor I did save it for the follow-up message with three smaller pictures that seems to have been deleted too. I’ll try to restore the messages tomorrow morning. Now I see that the presentation of images has changed since my previous picture posts (March 2011). They are not scaled automatically anymore. Still, it is possible to see the whole picture by clicking on it. Here is another attempt to share my observation made yesterday, January 16th, 2012. The pictures can be seen above in my posts on 5:01 pm and 5:45 pm. Nevertheless, the racetrack and circular orbit contrails are visible. I highlighted them on a Google Earth screenshot together with my viewpoint (third image). Both contrails cast the shadows on the ground, allowing the estimation of their altitudes, 12 km and 9 km, respectively. Unusually, there appeared little wind up there, less than 10 mph, resulting in the AWACS contrail coils being quite close to each other. This suggests that the contrails did not move much by the time when I noted them. Indeed, knowing the exact position and FOV of my camera, I readily fitted on Google Earth the contrail models based on the satellite image into my photos (the fourth and fifth images). The racetrack contrail was from some 50 miles away from me at the closest point to more than 100 miles at the furthest point. Being about 100 miles long it just fitted into the widest angle (~70°) of my camera. The circular orbit contrail was closer, between 20 and 50 miles. Zooming on the plane at the closest point (on the two consecutive turns some 12 minutes apart) I got the images (sixth and seventh ones), showing that the plane does look like Boeing E-3 Sentry (AWACS). The last, eighth image is a photo of the same or similar plane passing right over my head two days earlier. A good calm weather and clear skies above England ensured that the unusual contrails were spotted far and wide across the country, reported by local media, discussed at various forums etc. Pictures and videos were taken, and the planes were identified. The racetrack contrail was left by RAF Sentinel R1, ZJ692, whereas the circular contrail came from NATO E-3A Sentry, LX-N90454. Places were the racetrack contrail was sighted include Worcester in the West (about 100 miles from my place), Farnborough in the South and Crewe, Cheshire, in the North (these two places are 140 miles apart). The reports of AWACS contrail sightings came from several places in a surrounding area of least 80 miles across. While browsing through numerous reports, I noted that the observers generally underestimated the scale of these contrails and assumed that the aircraft circled the sky much closer to their places than it actually was. It was educational for me too, as before I did not fully realize that some contrails that I can see from my place are farther south than London and farther west than Birmingham. where are the military flights reported – are they on FlightRadar? I was not able to check this on my computer at the time and found no mentioning about this at the aviation enthusiasts’ forums. However, when the US Navy Boeing E6A Mercury was flying around the UK for several days in a row at the end of April 2011, it was on FlightRadar24. I saw it myself.